I’m down to about four playlists. There’s Party, which is what it sounds like. There’s Peaceful, which is for chilling out. There’s Folks, which is stuff my mom and stepfather can deal with. And there’s Now, which is basically all of the above plus anything I’ve recently acquired that I want to be paying attention to. All of these playlists are vast, many days long, and I just shuffle through them. Like you, I also have a bunch of best-of playlists and shorter things I’ve made for friends, plus various groupings of my own tracks that I’ve assembled for one reason or another. I have yet to encounter an algorithmic playlist system that has much value to me. They can be fun for discovery of new things, but personal recommendations matter a lot more to me. 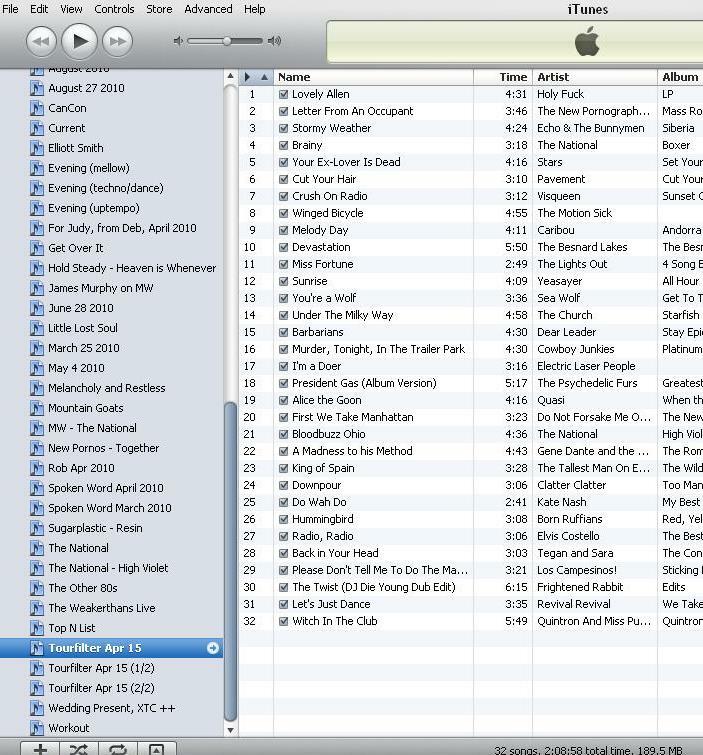 I also do the playlist thing for books I put into my player. Since it only keeps things listed by disk I have to go in and manually put all of the Chamber of Secrets into a playlist and in order. One wish for the musical playlists though is an ability to mix it up permanantly without leaving shuffle on or redoing the entire list. I’ve been listening to a few playlists recently. One of my Best of 2010 list. I also have one, embarrassingly called “crunk,” where I put Jay-Z, Ke$ha, Lady Gaga, The Killers and other assorted jams/guilty pleasures/dancetastic cuts. I also have a Fall 2010 traveling mix to soundtrack all the traveling I’m doing next month. I love to listen to the playlists from past mixes I’ve made for friends. And the good ol’ Recently Added list is the only way I stay up on anything I buy/download/rip.